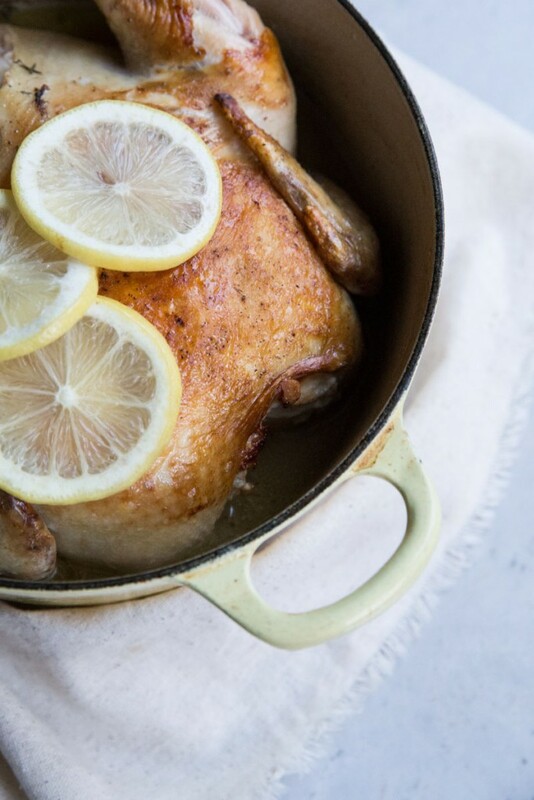 This very simple recipe for Coconut Milk Roasted Chicken is just about the easiest, most reliable way to roast a chicken. The recipe takes only 10 minutes of prep and the coconut milk ensures moist results. If you’re looking for something other than turkey to serve for the holidays, this just may be your answer. A few years back we dined with some friends and they served milk braised pork with lemon. It was a luxurious meal and one I’ll think of for years to come. Since then I’ve tried my hand at similar recipes and seen many folks online do similar techniques even with chicken. The richness of the milk, along with the idea of roasting with a liquid, transforms the meat into something all together new for a roasted chicken. I wanted to experiment with a non-dairy version so I tried coconut milk. Now, we’ve made this recipe countless times and we use it as our beginning of the week recipe so that we’re ensured to have chicken on hand for lunches or quick dinners throughout the week. Similarly to the Cider Slow Cooked Pork I shared a few posts back, this recipe is a great one to make then use in several different ways. The first night we make this dish we serve the hot chicken over white rice with plenty spoonfuls of the sauce (maybe adding in some spinach or kale wilting into the hot coconut broth). The next day, I might use some of the chicken for this Coconut and Kale Chicken Salad or I’ll separate the fats from the cooking liquids and use the broth along with the shredded chicken, add in some veggies, and make a Coconut Chicken Soup. The chicken shredded up could also be used in enchiladas, Chicken Pot Pie, casseroles like this Cheesy Baked Quinoa with chicken or this Chicken and Asparagus Gratin, or soups like this Lemon Chicken and Rice. All that to say, this is a recipe to make all your chicken dreams come true. I think it would even make a great meat to share for a small holiday gathering. No one at your table needs to know just how easy this is to make!! 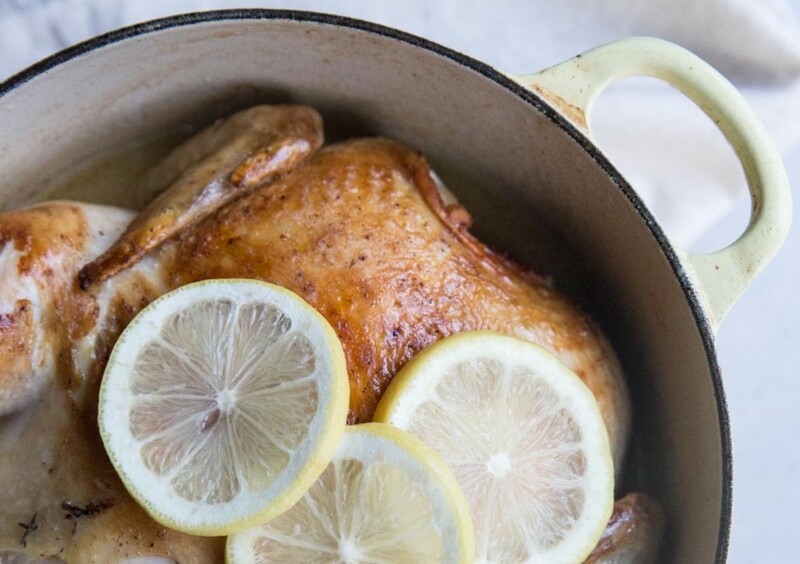 Try this super easy way to roast a chicken using coconut milk to ensure rich and moist chicken meat. Preheat oven to 400 degrees. Pat dry the whole chicken with a paper towel then season well with the salt and pepper. Heat up the oil in a large, oven safe, dutch oven over medium high heat. Add the whole chicken breast side down first and sear for 8 minutes (set a timer). Flip then sear the other side of 4-5 minutes. Meanwhile, combine the coconut milk, thyme, and shallot. 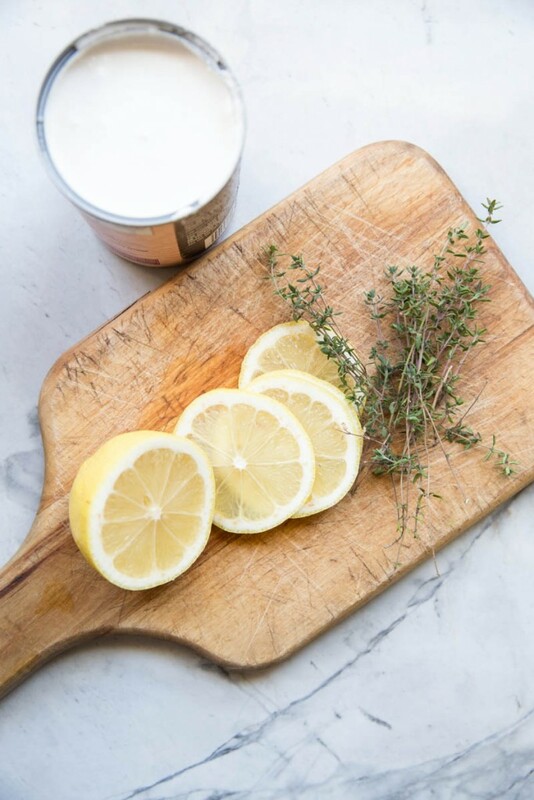 Slice a few thin slices of lemon to add to the roasting chicken towards then end of roasting then, use a vegetable peeler to peel off a few long pieces of lemon rind and add that to the coconut milk along with the rest of the lemon half. You can heat this mixture up on the stove top then pour it to over the chicken or if you're in a hurry just add it all in at room temp. 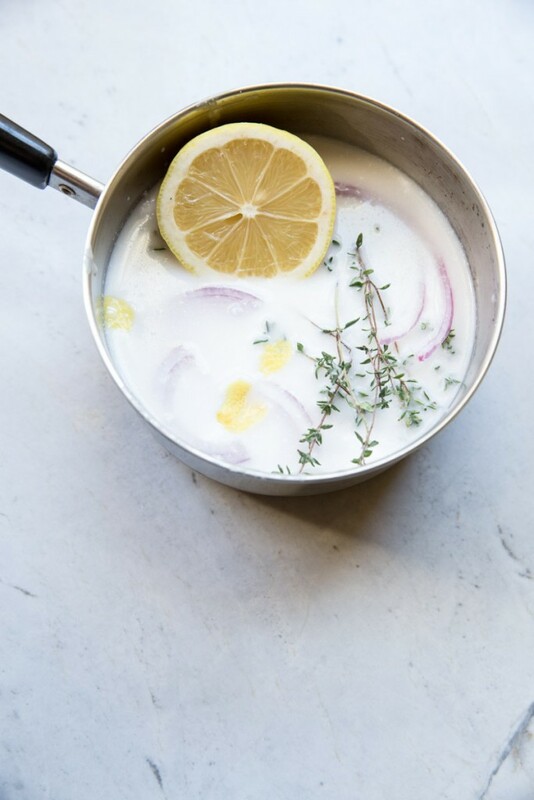 If you're adding it hot, make sure to remove the dutch oven from the heat so that the milk does bubble over when you add it. Roast the chicken with the coconut milk mixture at 400 for 45 minutes, partially covered. 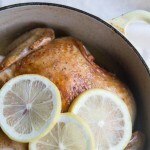 Uncover and add the lemon slices to the top of the chicken and continue to roast for 15 minutes or until chicken reaches an internal temperature of 165 degrees. Whole milk can also be used instead of coconut milk. For more roasting liquid (if you're going to make a soup out of the juices) add in 1/2 cup vegetable or chicken broth to the coconut milk mixture. I have heard of this before… I think Jamie Oliver. I am going to have to try this recipe for sure. I love it when one recipe turns into three meals. Thanks. Yes, Jaime Oliver does a cows milk version. I think the original idea is Italian. Hope you’ll try it out!